Definition at line 742 of file compat.h. Definition at line 748 of file compat.h. Referenced by copy_line_32_from_64(), copy_line_64_from_32(), copy_line_W64_from_64(), rsym_finalize_function(), and stabs_finalize_function(). 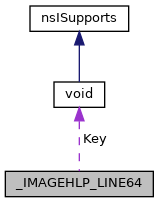 Definition at line 747 of file compat.h. Referenced by copy_line_32_from_64(), copy_line_64_from_32(), and copy_line_W64_from_64(). Definition at line 745 of file compat.h. Definition at line 746 of file compat.h. Definition at line 744 of file compat.h. Referenced by SymGetLineFromAddr(), SymGetLineFromAddrW64(), SymGetLineNext(), and SymGetLinePrev().